Train your dog to come, before it's too late! Have You Tried to Train Your Dog to Come? Train your dog to come, BEFORE, the situation arises where his life is in peril, and the only thing that will save him is a good understanding of the command word, COME. Okay, maybe I’m being a little melodramatic, but if your dog spends much time off leash, he’s going to discover something much more exciting than you to pursue. If you are in a wide open field, with acres of land between you and the closest road, you’re probably safe. But who has that kind of luxury these days? Better to be safe than sorry when it comes to your dog’s safety. The Goal of this command is for your dog to come immediately to you when called. This is no small feat for a Shih Tzu, who has a real stubborn streak and the quintessential, “what’s in it for me,” attitude. The worse part of this defiance is that you are likely to be on the losing end of the leash (or lack thereof). It doesn’t matter if it’s a squirrel or a blowing leaf, if it looks attractive, your Tzu may take off. They have a very low prey drive, so it’s likely they are just looking for adventure or perhaps a new playmate. 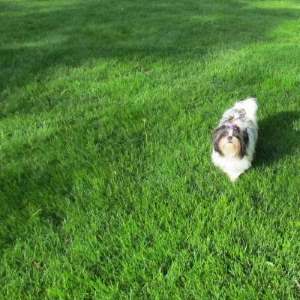 Some Shih Tzu dogs love to run just for the sake of running. They take off at top speed and forget where they’re going until it is too late. Is your dog like that? In the completion, this command ends with your dog sitting in front of you. You can breathe in a sign of relief, and your dog can get a treat. In order for this command to be consistently obeyed, your status as a pack leader needs to be definite. 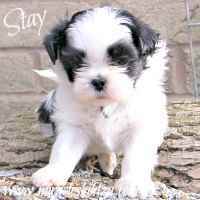 You will always want to reward your Shih Tzu for obeying your “come” command, whether it is with praise or a treat. If you are outdoors and use the “come” command, be prepared to offer three treats. We give three treats because the time it takes us to attach a leash or grasp the collar is about the same time the dog can consume the three treats. A dog can learn the meaning of the word very quickly, but the practice and enforcement of this command should continue for life. 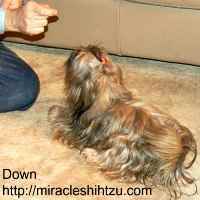 To train your dog to come, you will need to reel your Shih Tzu into you in order for him to understand the command. To be safe, only practice this command with your Shih Tzu wearing a harness rather than a collar. Injury can happen if you pull too hard on the leash when it is connected to a collar. If you like, teach the commands, Come and Stay in the same training sessions. Ask your dog to stay, and then follow the directions below to encourage him to come to you. Why 3 Treats When You Train Your Dog to Come? It is important to give your dog 3 treats when he comes to you. But Why? When you train your dog to expect 3 treats when he comes, it gives you time to either put a leash on him or pick him up. If he knows he's getting only one treat, he has the option of grabbing the treat and taking off again. Dogs are NOT Dumb! With your Shih Tzu on a 6 foot leash, say his name and “Come” very enthusiastically. You can pat your knees or clap. If he comes, praise, say, “Good Come” and reward. The reward at first should be three tidbits of his favorite treat. Later, you can use praise and pats. If he does not come immediately, pull gently on the leash. Your command itself should sound happy, but firm. Give the command only once. You can begin to use a longer lead when your dog consistently comes when called. Once you have achieved good consistency on leash and indoors, you are ready to practice off-lead. Do this in a fenced area. Let the leash be attached, but do not hold onto the other end. If he does not obey your command when you say it one time, go to him and firmly lead him back to the spot where you give the command. 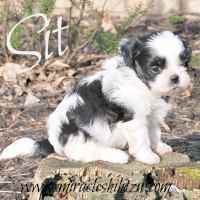 Do not give a reward if your Shih Tzu does not perform the command on his own, the first time you say it. Put the long lead back on him and require him to do 5 successful “Comes” before attempting off-lead again. As you train your dog to come when you call, don't be surprised if you encounter a problem or two. Shih Tzu dogs are smart, but to my knowledge they have never held a world wide spot as too obedience dog. What they deserve is our patience, so don't expect perfection the first or even the fifth time. It will come. Once off lead, my Shih Tzu runs off! Never chase your dog. If you towards him, you will only encourage him. He will think you are playing a chasing game with him. Stand your ground and demand that he comes. Pat your knees and turn your body partially towards the area you want him come. Your body language will tell him that he is to come this way. Continue to practice indoors. Go into a separate room and call your dog, “Buddy, Come.” Provide your treats and act really enthusiastically when he does come. If he loves toys, be prepared to give him one of his favorite toys. Continue to practice indoors, room to room until your dog is more consistent in Come. Train your dog to come, before you encounter a situation where you need him to come. Set your dog up to be successful. Don’t begin to train outdoors with lots of distractions. Always start slow and easy, where your dog won’t be sidetracked with anything that would seem more exciting than the game of Come. If you found this article helpful, you may also enjoy these resources.